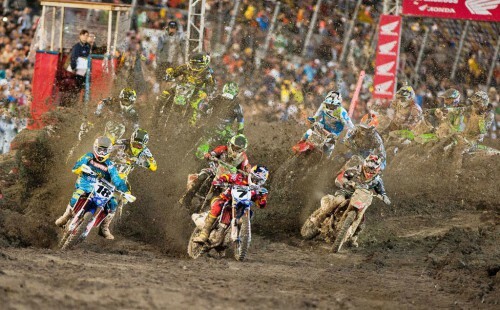 James Stewart gave his 2012 AMA Supercross championship hopes a much needed boost with a big win in sloppy, muddy conditions at Daytona International Speedway. 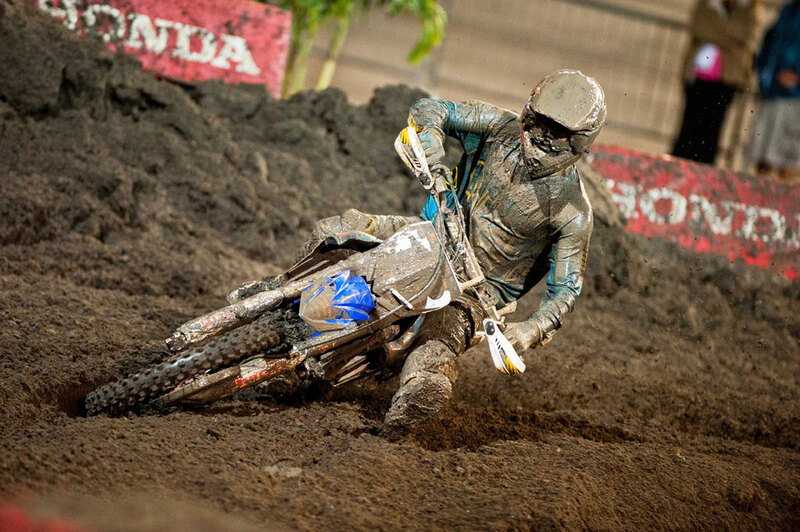 Heavy rains made the Ricky Carmichael-designed track in Daytona’s tri-oval section even more difficult than the GOAT conceived, with the terrain rough, choppy and rutted. Series point leader Ryan Villopoto became an early casualty of the track conditions, sliding outon the second corner. 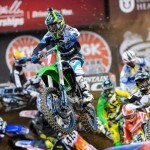 That dropped him back to the rear but the Monster Energy Kawasaki rider was able to rejoin the race. At the front of the pack was Stewart and his YGRMX Yamaha teammate, holeshot taker Davi Millsaps. 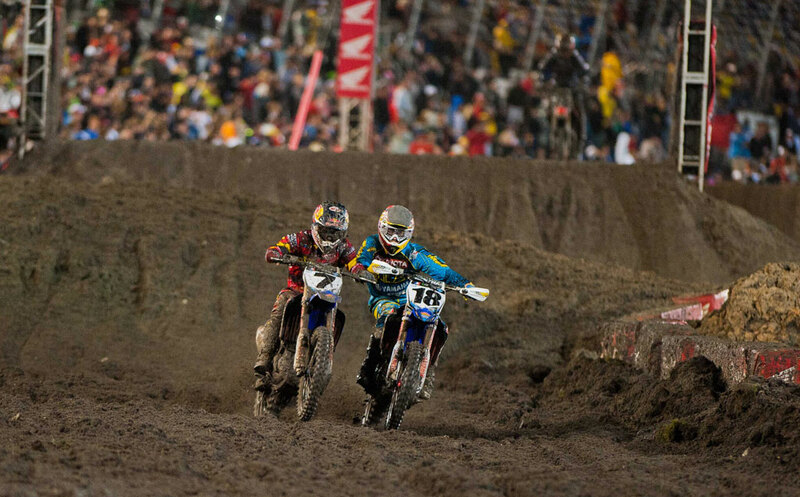 Millsaps led the first two laps but lost the lead for good to Stewart on the third lap. Stewart would cross the line first with Millsaps 7.573 seconds behind for his first podium finish in two years. 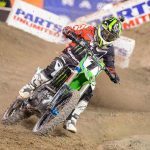 For Stewart, the win was his 44th in AMA Supercross but 89th in Supercross and Motocross combined, tying him with Jeremy McGrath for second overall in that ranking. 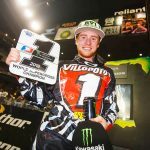 More importantly, the win helped trim his deficit behind Villopoto in the championship standings. Finishing third and 19.499 seconds behind Stewart was Geico Honda‘s Kevin Windham for his first podium finish of the season. 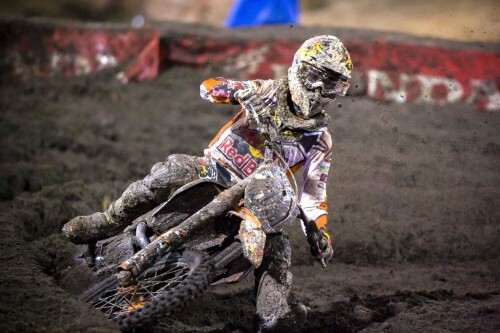 Fourth place went to Marvin Musquin of the Red Bull KTM team. The race was just his second ever in the class and follows a ninth place finish in his debut last week in St. Louis. Unlike his teammate Ryan Dungey, who missed the Daytona round due to injury, Musquin is racing on the KTM 350SX-F instead of the 450. Villopoto rebounded from his first-lap accident to finish fifth and further add to his championship points lead. 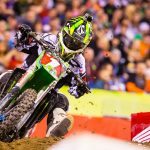 After ten rounds, Villopoto leads all riders with 221 points. At second place with 192 points is Dungey who is expected to return for next week for the Indianapolis round. Stewart is next with 177 points and an outside shot at the title while Weimer’s podium pushes him up to fourth overall.